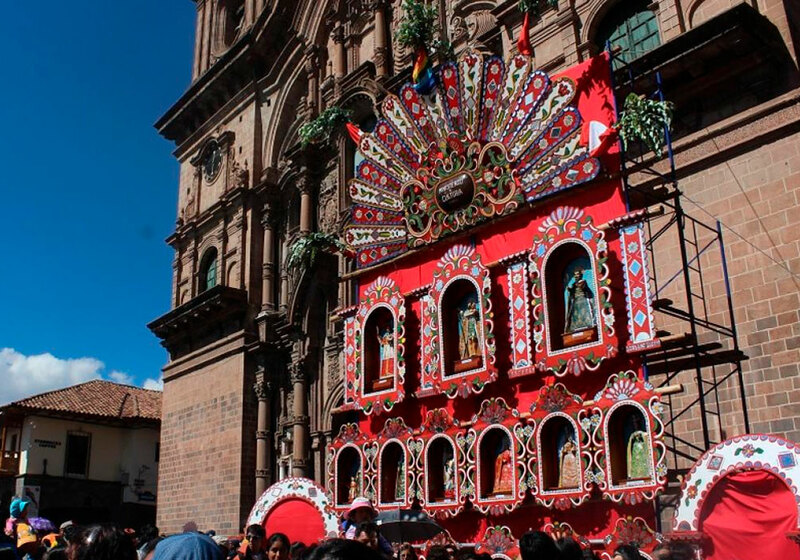 This article was posted on Tuesday, April 16th, 2019 at 2:00 pm and is filed under Cusco Tours, Festivals, Holidays. Although it would be inaccurate to affirm that every year the doors of heaven are opened, so that an outpost of virgins and saints can walk in a procession in the streets of the Historical Center of Cusco, with the purpose of spending the night in the Cathedral, dialoguing and exchanging views with the host (the miraculous Lord of the Earthquakes known in this and other lands as the “Taytacha” of tremors), what we dare disclosed – even at the risk of being inaccurate – are the details of that annual conclave. Although there are several versions of this – for example, it is said that the saints talk and agree on the fate of the city and its devotees – we cannot endorse any of them, because we have never been eyewitnesses of what happens at the end of the Corpus Christi Entrance Day. That meeting is not multitudinous; it is confidential and almost secret, unlike the processions. There are many, so many that, even if it is inaccurate, it is not nonsense to think or believe that with the complicity and consent of Saint Peter -who also walks around here- the doors of heaven were opened so that the revered virgins and saints in the Cusco churches, take a stroll through the Andean city. And it is that the Corpus Christi in the ancient Inca capital is, in essence and in practice, a meeting of the main images of the neighborhoods. They, after being dressed for the occasion, leave their temples accompanied by hundreds of devotees. The entourage of the patron or patron includes, in addition to the stewards and gangs of loaders, musicians, dancers, singers and even specialists in pyrotechnics. This is the custom. That happens every year and it is quite probable that its origin is related to the “mallquis”, the mummies of the Incas. These were respected and treated with special care, so much so that they retained their privileges and asked for advice. At that time, there was a habit of removing them from their homes, so that they would ‘get together’ and ‘talk’ with other “Mallquis”. What happened next is easy to imagine. The mummies were replaced by Catholic figures, as part of the process of evangelization in this part of the world. In the early years, it is very likely that the ‘new devotees’, who carried on their shoulders to San Pedro or San Sebastian, Santa Ana or the Virgin of Remedies, felt in the depths of their hearts that they carried their ancestors. Religious syncretism is reflected in Corpus Christi, the solemnity of the Eucharist, the sacrament that Jesus instituted and instituted at the Last Supper, after consecrating the bread and wine, moments before the betrayal of Judas. In the Masses, the hosts are the body and the wine represents the blood of the Son of God. This fundamental aspect of the faith is commemorated 60 days after Easter Sunday. This year the Corpus Entrance will be held on Thursday, June 20. Go ahead and enjoy your trip in a different way, seeing the passage of the images that go to the Cathedral. Each one has its history and its anecdotes. To San Cristóbal -and it is not a sin to affirm it- he likes the “chicha de jora” that is prepared in the neighborhood of Santa Ana. And in these lands, the grandmother of Jesus is the patron saint of the “picanterías”. San Sebastian, on the other hand, is quite daring. Go naked, ‘calatito’ as it is said in Peru; while the Patrón Santiago is not very well seen otherwise. The fault lies with his horse, which, because it is half runaway, causes tremendous uproar in the Cathedral. It’s not the only one. The same is said of San Pedro, although for a different reason. He, with his jokes and decires, manages to make Taytacha Trembles happy. There are more stories. 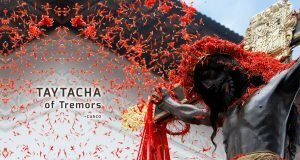 Each saint or virgin has a secret that his devotees share amusingly, after praying, dancing or extinguishing hunger with a contudente chiriuchu, the typical dish of Corpus that carries hen, guinea pig, chorizo, “cochayuyo” (seaweed), corn tortilla, “charqui”, court, among other ingredients. 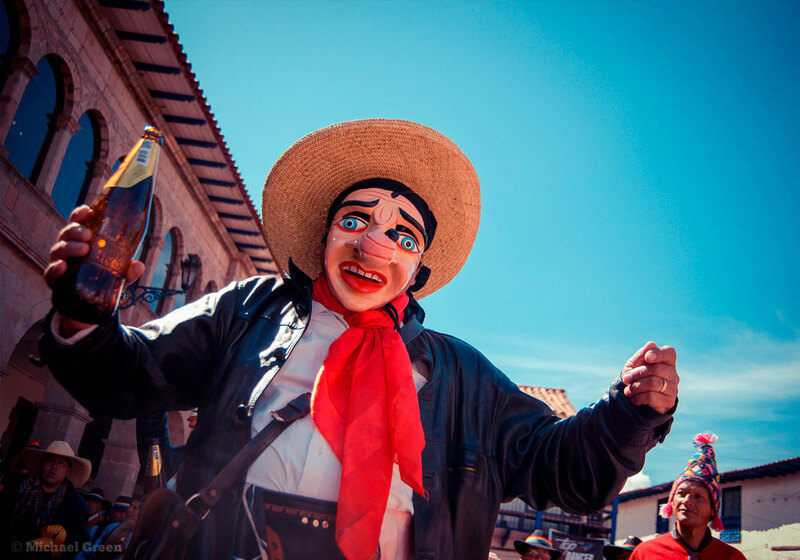 Try it in a picantería or in the Plaza San Francisco, where a festival is organized in honor of so appreciated stew … but never as appreciated as the images of Cusco. They receive an infinite affection, an affirmation that unlike the one mentioned at the beginning of the text, is not in any way an inaccuracy. It’s true, the pure truth. You can check it in the next entry of Corpus Christi. Images: In the Cusco Corpus Christi come in procession San Blas, San Antonio Abad, San Cristobal, Santa Ana, San Pedro, Purified Virgin, Virgin Nativity of the Almudena, Virgin of Bethlehem, Virgin of the Inmacula Concepción, Virgen de los Remedios, Patrón Santiago, San Jerónimo, San Sebastián and Santa Bárbara. 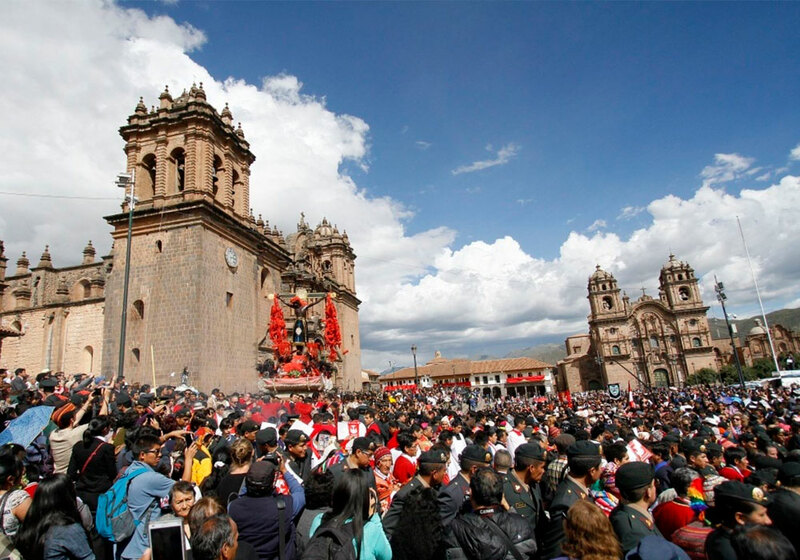 The beginning: The entry of the Corpus begins formally in the Plaza de Armas, with the procession of the Blessed Sacrament or the Custody that is usually carried by the Archbishop of Cusco. The images arrive later at the Cathedral. The year: In 1572 the Viceroy Francisco de Toledo officially instituted the celebration of Corpus Christi. Chiriuchu: in Spanish it is translated as chilli cold or spicy cold. Picantería: It is the name that Peru receives the restaurants that offer the typical dishes of a city or region. Do not forget to visit them during your Peruvian vacations.